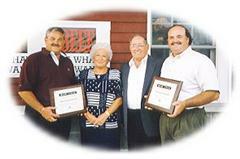 In 1992, Steve and Arthur created a second restaurant, Sboro's Restaurant, built on Grandma Marie's original homestead. Sboro's Restaurant is constantly evolving with new dishes and new concepts, while remaining very consistent in its excellence. Brothers Arthur and Steven, and their families, are involved in all aspects of the business from the minute you step in the door. From seating you to serving you, making your pizza or cooking your dinner, they are all working together to continue the tradition. They are still doing things the old fashioned way with great-grandmother Marie's original recipes. They also use many of their grandfather Art's, and grandmother, Johanna's recipes, standing behind the philosophy of providing good food, quality service, and a family atmosphere in a clean, comfortable setting. The company has continued to grow by building on the loyalty of their dedicated employees. Not only do employees stay for a long while, they recruit their family members to come work for the Sboro family. Today, the Sboro family continues the over 100-year-old tradition by keeping their restaurants a family-run business, specializing in old recipes– all homemade. We hope you have enjoyed this bite of Sboro history and look forward to serving you and your family soon.